My friend Agah Bahari is interested in everything, which is one of the things that I love about him. Not that long ago, he decided to indulge his interests by starting something he calls the NeoHuman podcast (which matches nicely with his NeoHuman blog), inviting many of the interesting people he knows to discuss pretty much anything that comes up. Well, seems he ran out of interesting people and so he invited me to participate…and we talked about anything: biotechnology, pharma, global healthcare, designer babies, creativity, writing, screenwriting, 9/11, marketing, and the novel he and I are writing about his life. If you met an intelligent alien life-form, what would you describe as the greatest human accomplishment and as the worst human accomplishment? Never boring, my friend Agah. Athletics bodies have questioned whether sprinter Dutee Chand has an unfair advantage. The question may sound absurdly philosophical, particularly for the pages of DDNews, and yet healthcare directly or indirectly deals with this question on a daily basis. And the clinical response can be as life-altering as the societal and political responses that we see on the news every night. An entire industry has been created to test and monitor health using various diagnostic assays, to the most recent of which DDNews dedicates an entire section. In some cases, the results of these assays are binary—the classic example is being a little bit pregnant. But in most cases, healthy (or normal) falls within a range of values—think LDL/HDL, blood glucose or body temperature. In part, this is a recognition that results can vary within an individual throughout the day, and on the larger scale, because individuals are products of their genetics and environments. What might be a healthy level for me in Toronto may actually be limiting in Johannesburg. But even with the recognition of variability, we must always be vigilant in questioning how the normal range was defined. Was it based on the combined results of 200 male Manitoba bush pilots (I have read such a study), or a sampling of tens of thousands of individuals from around the world? If only for economic reasons, the former is more likely to be the case. In 2011, Boston University’s Shalinder Bhasin and colleagues examined this challenge by identifying reference ranges for testosterone in healthy men. Suggesting that these ranges “have been derived previously mostly from small convenience samples or from hospital or clinic-based patients,” they examined a much larger cohort from the Framingham Heart Study (Gen 3), publishing their results in the Journal of Clinical Endocrinology & Metabolism. Although most values were consistent with historic values, their lower limit of total testosterone was higher than that used historically but was “closer to the thresholds associated with sexual and physical symptoms in a recent investigation of older men.” Thus, when it comes to testosterone, it seems (sample) size matters. But what about the outliers, the norms who don’t fit the norms and the unwell who do? As a bit of a sidestep, just over a year ago, the International Association of Athletics Federations (IAAF) banned Indian sprinter Dutee Chand from competing in sanctioned competitions because her blood testosterone levels fell into the normal range of male athletes rather than that of her female competitors. Thus, the group decided, she would have an unfair advantage over her fellow runners. What made this ruling particularly challenging, however, was that Chand’s testosterone levels were natural; they did not come about from doping. Her levels simply fell outside of the clinically accepted norm for women. Closer to home for me are two friends who live with symptoms of hypothyroidism and have resorted to alternative medicine because they were dissatisfied with the medical establishment. In both cases, standard thyroid function tests suggest they fall within the normal range and therefore would not benefit from standard treatment. This may be true, but neither knows because it was never tried. Admittedly, these are anecdotes. Three women struggle because they do not fit ascribed definitions, whether of health or pathology. And for every anecdote I can list, the healthcare establishment can rightly point to hundreds if not thousands of individuals who fit the defined ranges of normalcy. It’s a conundrum I have discussed previously: healthcare is population-based while health is personal. In our zeal to standardize healthcare and make medicine more scientific, we have to be careful not to ignore the natural variabilities of individuals within those populations. So-called normal ranges should suggest action, not dictate it. Even as we pursue the precision medicine mandate, spending billions (and possibly trillions) of dollars on expanding our understanding of human biology and generating technologies to value every facet of it, we have to make sure that our knowledge doesn’t blind us to the patient’s truth. If that happens, if all we accomplish is a bigger monolith, then we have failed in the mission. As to Chand’s racing career, the Court of Arbitration for Sport recently overturned the IAAF’s rule, giving them two years to prove that the higher testosterone levels truly give the runner an unfair advantage. Originally published in DDNews in September 2015, this is one of a series of commentaries I write each year. If you’re interested in recent technological and business innovations in biotech, pharma and healthcare, you should check the publication out. Because my mother refuses to throw anything away, but prefers to store it in a drawer or cupboard until I come for a visit, I was reminded this past trip to BC about a phase in my writing career that kind of occurred sideways. Several years ago, I was in desperate need of a job (wow, some things never change). So desperate, in fact, that I decided to take a flyer on and leverage my background in science writing and magazine editing for a job as editor of a manufacturing automation industry trade magazine published by CLB Media. It should be noted, I knew and to this day know nothing about manufacturing. But I can write and I can edit and I have a good idea for design. I also have a fondness for money. It was obvious throughout the interview with the magazine’s Publisher and Director of Sales & Marketing that I could write and knew magazines well, but that if I got the job, I would have to scramble to understand the issues and lingo of a completely alien industry. They were kind, but it was obvious the job and I were not a match. When I finally got home, I was in the middle of discussing the interview with my wife when I received a phone call from the company VP, Publishing who said my interviewers had mentioned me and that the company had a medical humour magazine (Stitches) and companion consumer pub (Stitches for Patients) that were in need of a new editor. Would I be interested in talking to him and its Publisher the next day. The job didn’t last very long–the magazines had been in a steady decline for years before they found me and never recovered sufficiently to keep operating–but it was a great experience, and not only allowed me to write nerdy medical comedy but also allowed me to eventually add the title Associate Publisher to my resume. And all because I was desperate enough to apply for a job for which I had few qualifications but showed general competence and a willingness to listen and learn. I offer the covers of my first three issues of each magazine below (thanks mom). The insane covers are the work of the amazing illustrator Max Licht under the direction of the equally amazing Art Director Graham Jeffrey. 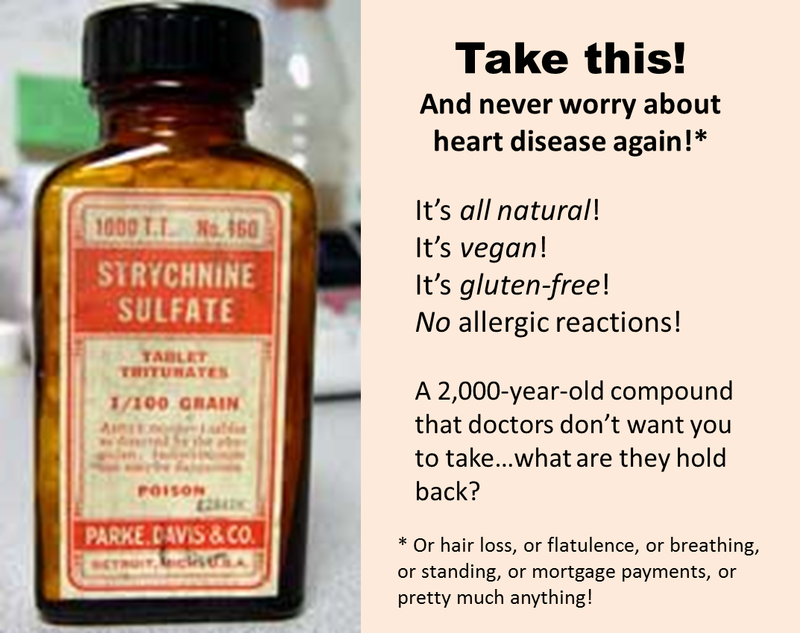 A little nervous about all of the ads I see for remedies that may not have a strong basis in fact but are merely sold on the strength of gimmicky phrases.